When will Lithuania’s government face the truth about the Holocaust? 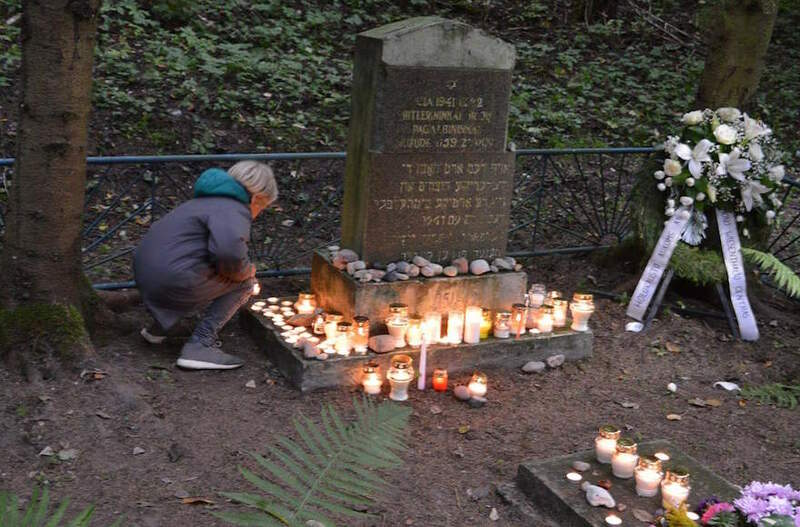 (JTA) — Residents of Vilna (Vilnius), Lithuania’s capital, had their pick of two events to mark the 75th anniversary of the Holocaust held this year on Sept. 23, their country’s official Shoah memorial day. The choice was rather simple because of the stark differences between the ceremonies, and which reflect a new and developing conflict between the government and some members of the country’s younger, liberal and more educated elite regarding the manner in which the Baltic country should commemorate the tragedy of its Jewish community. The earlier ceremony, which took place at Ponar, the site of the murder of approximately 70,000 Jews from Vilna and its environs, was organized by the government and the small (3,500) local Jewish community. As might be expected, it had its share of pomp with military honor guards, fancy wreaths and numerous ambassadors in attendance. Yet the lineup of speakers was quite disappointing. The president did not attend, nor did the prime minister or the foreign minister, nor even the mayor of Vilnius, who for unexplained reasons chose to take the day off. The speakers on behalf of the government were second- or third-tier bureaucrats or veteran politicians no longer active on the political scene. Their platitudes about remembering the victims and honoring the legacy of the Holocaust rang especially hollow. After all, since independence, every Lithuanian government has made great efforts to minimize or hide the highly significant number and role of the local Nazi collaborators, and the fact that those Lithuanians who participated in the murder of Jews came from all strata of society — from the clergy, intelligentsia and professionals to the hooligans and illiterate farmers. It was no accident, therefore, that Lithuania had the highest percentage of Jewish Holocaust victims per population (96.4 percent), a fact that is never mentioned at such events. 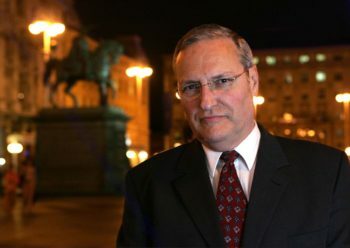 Perhaps just as bad, if not worse, have been the efforts of all Lithuanian governments to promote the canard of equivalency between Communist and Nazi crimes, made manifest in the infamous Prague Declaration of June 2008, which demands parity in the treatment of the two totalitarian regimes. The only refreshing words of wisdom heard at Ponar came from Jewish community chairperson, Faina Kukliansky. In her surprisingly frank speech, she called upon the government to finally publish a list of local perpetrators, whose identities have been hidden for years, and to change the names of streets and public institutions that honor anti-Soviet heroes who murdered or incited to murder Jews during the Holocaust — two additional issues that clearly reflect the government’s efforts to rewrite the history of the Shoah in Lithuania. The size and makeup of the crowd were also indicative of the current situation. Of the 300 people attending, only the Jews present came voluntarily. The others were there either as part of their jobs or were high school students who had no choice in the matter. This was in sharp contrast to the 80 people who came to the second ceremony, which was held at Veliucionys, also on the outskirts of Vilna, but among the most neglected of the 227 mass graves of Holocaust victims in Lithuania. The ceremony was part of an individual initiative, launched on Facebook, titled “Cia guli Musiskiai” (“Here lie our people”), by the popular Lithuanian author Ruta Vanagaite, my co-author of the recent book “Musiskiai” (“Our People”), which deals with Lithuanian complicity in the Holocaust and the government’s efforts to hide those crimes. The project, launched only several weeks ago, encourages Lithuanians to visit Holocaust mass graves all over Lithuania, many of which are totally neglected and never visited. Veliucionys was purposely chosen as the site of the ceremony, since in researching our book in the summer of 2015, we had enormous difficulty finding the site, which was incorrectly marked and virtually inaccessible due to the thick vegetation all around it. Thanks, however, to extensive coverage of the project by Delfi, Lithuania’s leading news portal, the local authorities cut the grass and even put up signs to make it easier to reach the site. We had no idea who would come, and whether there would be similar ceremonies elsewhere, but the results justified the effort. The 80 people who came to Veliucionys included some leading Lithuanian cultural and media figures, and quite a few families with young children. Together we marched the mile and a quarter from the area where the Jews were kept for several days to the mass murder site. Quite a few came with memorial candles, which lit up the area around the monument in a heartwarming manner, and many observed the Jewish tradition of placing a stone on the grave. Ruta related the fate of the 1,159 Jewish men, women and children who were murdered there, and the identity of their killers, Lithuanian volunteer murder squads. We later learned that similar events had taken place in the Kaunas Fort IV, Zagare, Lazdijai, Naujanerai, Vilkaviskis, Katkiskes and Saukenai. This change did not occur in a vacuum. It was preceded by the impact made by our book, and an amazing turnout by hundreds of Lithuanians to the Aug. 29 memorial march in Moletai, inspired by an op-ed on Delfi by playwright Marius Ivaskevicius, a native of that city who also participated in Veliucionys. The people who came to these alternative events were almost all members of the younger, more educated generation of Lithuanians who understand that hiding the truth about the Holocaust will not erase the crimes committed by Lithuanians or spare their country the embarrassment. Only by admitting and facing their past will Lithuania emerge stronger and more able to look forward to a better future. The question then becomes: When will this positive change finally be adopted by the government?